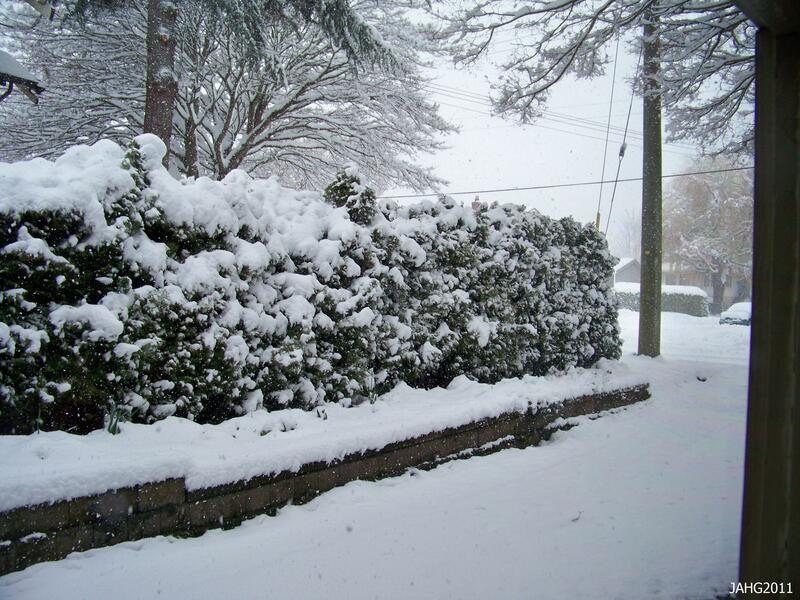 In 2010, there were 49 new posts, growing the total archive of this blog to 129 posts. There were 335 pictures uploaded, taking up a total of 439mb. That’s about 6 pictures per week. The busiest day of the year was September 15th with 274 views. The most popular post that day was Cheers for the New Year. The top referring sites in 2010 were blogcatalog.com, blotanical.com, search.aol.com, my.yahoo.com, and gardenersgreenthumb.wordpress.com. Some visitors came searching, mostly for cornelian cherry dogwood, viburnum dawn, cornelian cherry, vining plants, and viburnum x bodnantense ‘dawn’. Crimson Orange Goblets Swaying In The Breeze. When I was a small child bright and vibrant colors excited and fascinated me. 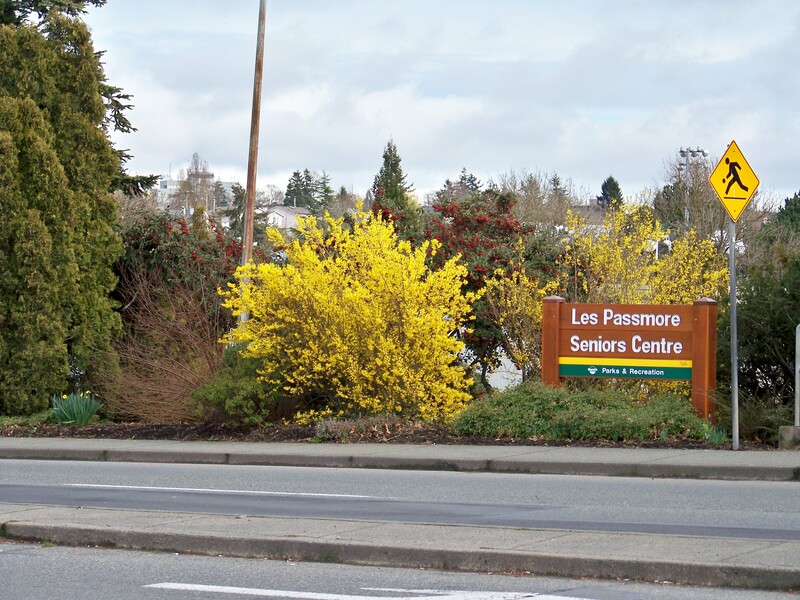 There was the clear yellows of the Daffodils out at the lake, the brilliant blue of the Siberian Irises at home. Near the end of the school year i would see the crimson-red of some Oriental Poppies (Papaver orientale) in a yard as I passed by. The silky smooth red petals with their black basal blotches always made me want to pick them for my mother…but I knew I would get in trouble so I did not. Oriental Poppies are not one species but are bred from several species which are very similar and found in the same general area. 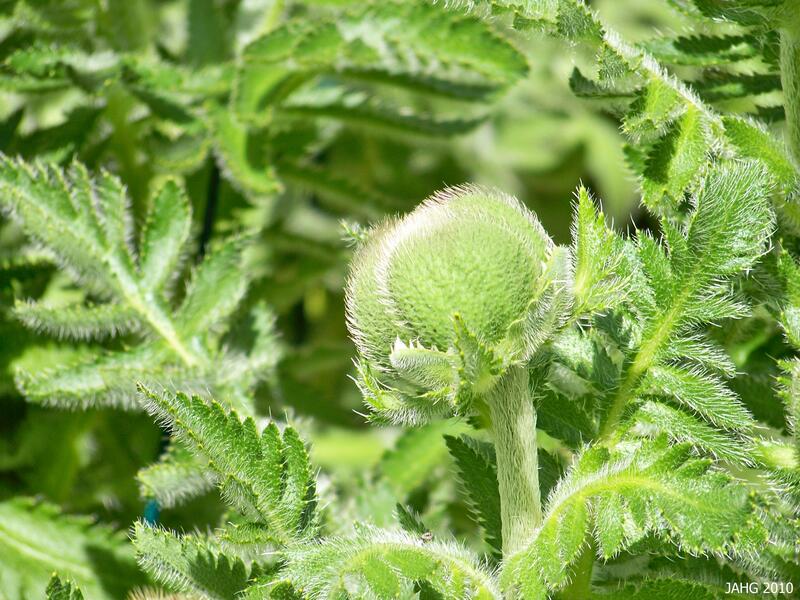 The first species was Papaver orientale which we know came to us in the early 18th century, it was sent to European gardens by Joseph Pitton de Tournefort(1656-1708) who was a French botanist. He is important for first defining the concept of genus and species in plants. 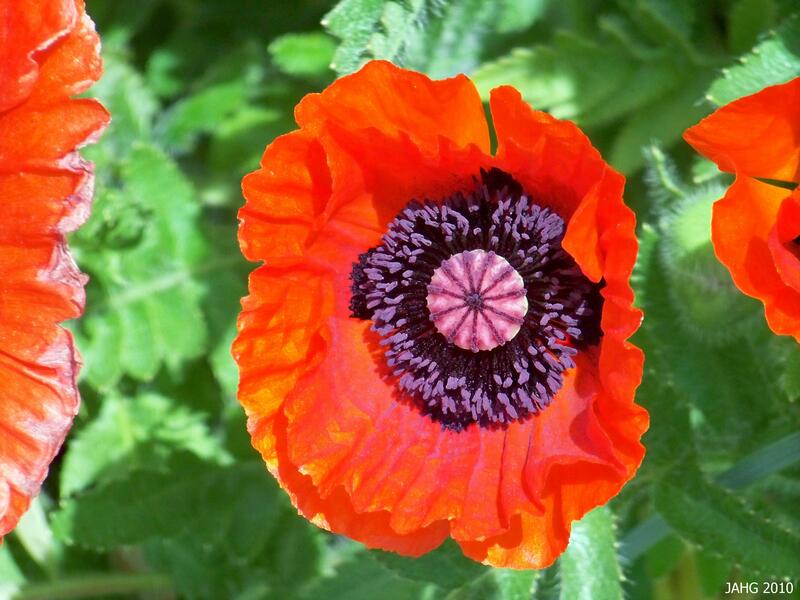 The next poppy species was Papaver pseudo-orientale which was introduced in 1788. The final species was Papaver bracteum which was introduced in 1817. The Poppy of my childhood is most likely called Papaver orientale 'Allegro' and has the common coloring of the species. All these species are found in the same general area ranging from northern Turkey and the southern Caucasus through into north-west Iran where they grow in isolation from each other. No one knows where they were first crossed or if it was on purpose. The red-orange Poppies were grown in gardens through the Victorian times but they were not really favorite types of flowers. Collectively in trade these crossed species are called Oriental Poppies and sold as Papver orientale. I am always a sucker for white flowers and the same hold true for this Papaver orientale 'Royal Wedding' flower. 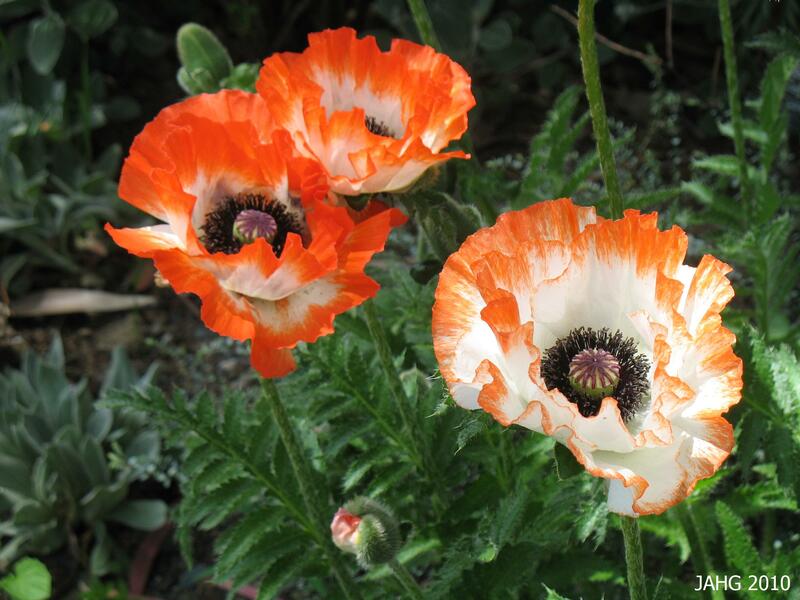 Interest in Oriental Poppies did not pick up until 1906 when Amos Perry(1841-1914) found a salmon colored flower blooming in a crop of the common orange-red type. He carefully saved it and named it Papaver orientale ‘Mrs. Perry’. Soon he had a plant everyone wanted to buy. 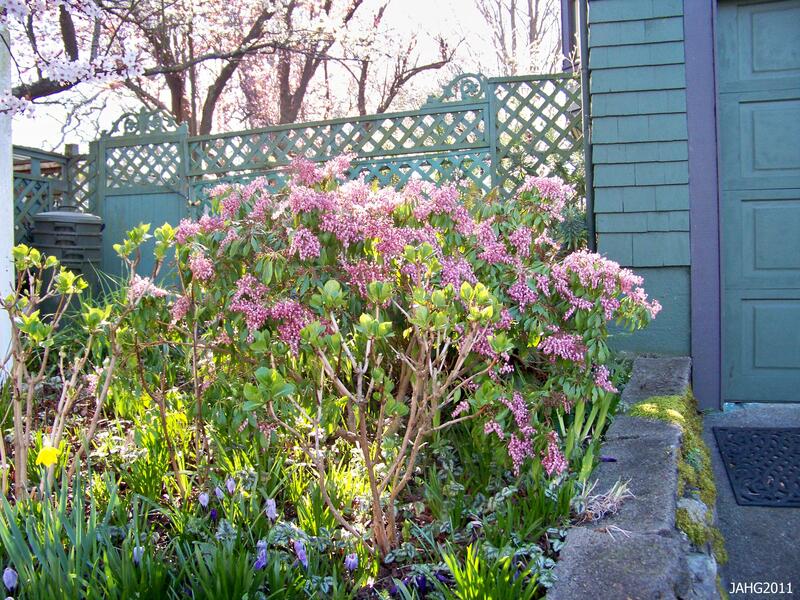 From finding this one plant his nursery embarked on a careful breeding program to select new flower colors to sell. The next named color also came by accident in 1913, people complained that their salmon ‘Mrs Perry’ Poppies were blooming white. the Nursery quickly apologized and replaced the plants for the white ones and named the newly found form ‘Perry’s White”. From this time into the 1930s many new colors from deep maroons to some forms with unusual leaves and buds were named, many have not survived through until now. A big, fat bud of Papaver orientale 'Harlem' is going to bloom in a few days. 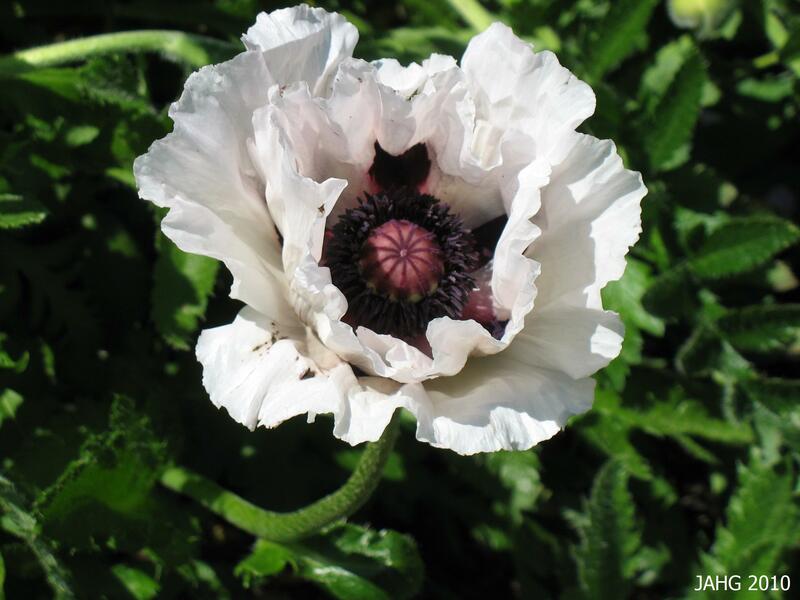 More recent program of breeding Oriental Poppies has been successful in Germany. 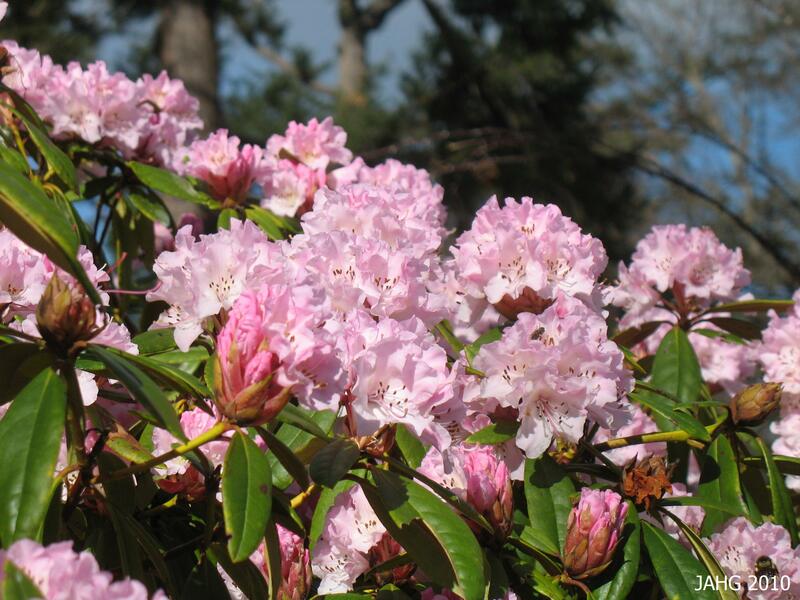 A nursery of Helene Countess von Stein- Zeppelin has breed some glorious named forms which include ‘Aglaja’(‘Alglaya’), ‘Karine’, Derwisch’and ‘John III’ to name some of the better known ones. Papaver orientale 'Turkish Delight' does not have a dark basal blotch at the base of each petal. In the last few years the dark mauve purple Papaver orientale ‘Patty’s Plum’ has created a sensation in the Poppy world. it was discovered by in Somerset, England in the compost dump at Kingsdon Somerton Nursery which is owned by Patricia Marrow. it has been known since the 1990s and sold to the public since 1999. 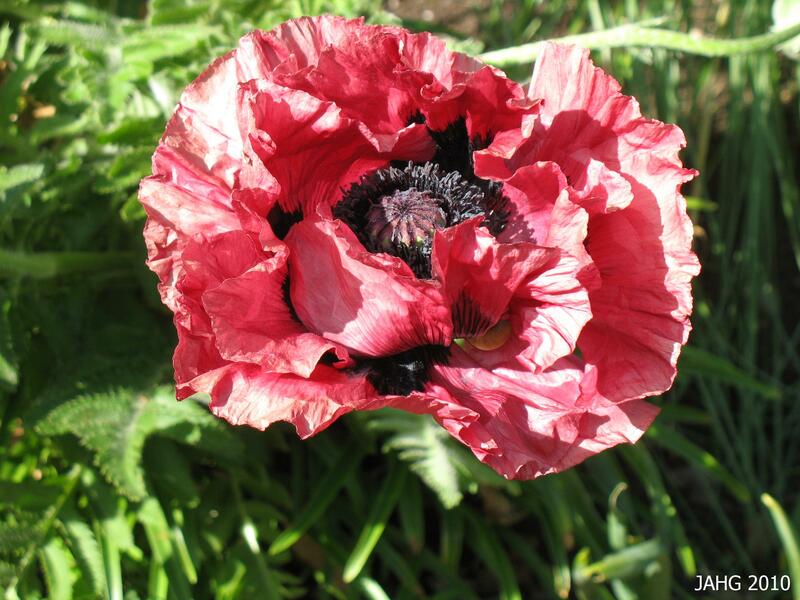 The color of Papaver orientale 'Patty's Plum' varies somewhat with the weather conditions. 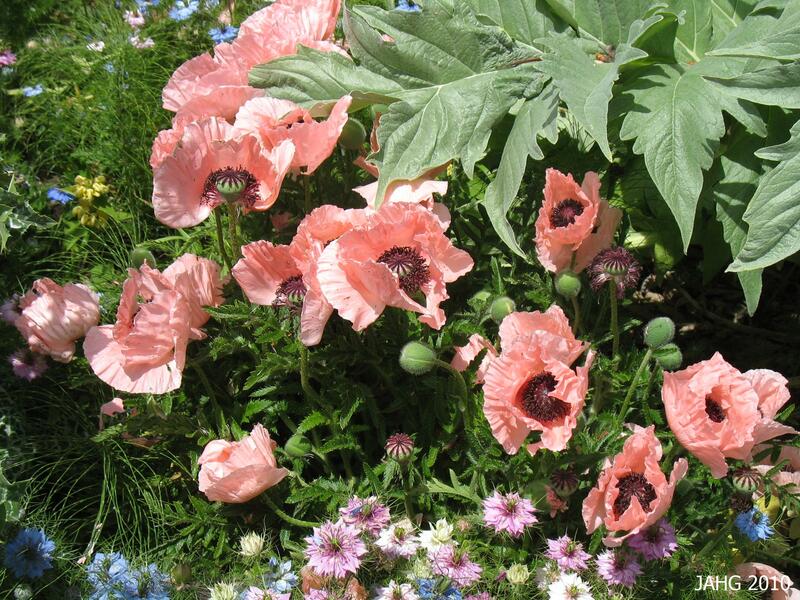 We are so fortunate that so many colors of Oriental Poppies are now available and are easy to grow. Papaver orientale can take the cold and survive nicely at temperatures of -40c(-40f) zones3-9 which why I saw them in my childhood in chilly Prince George. 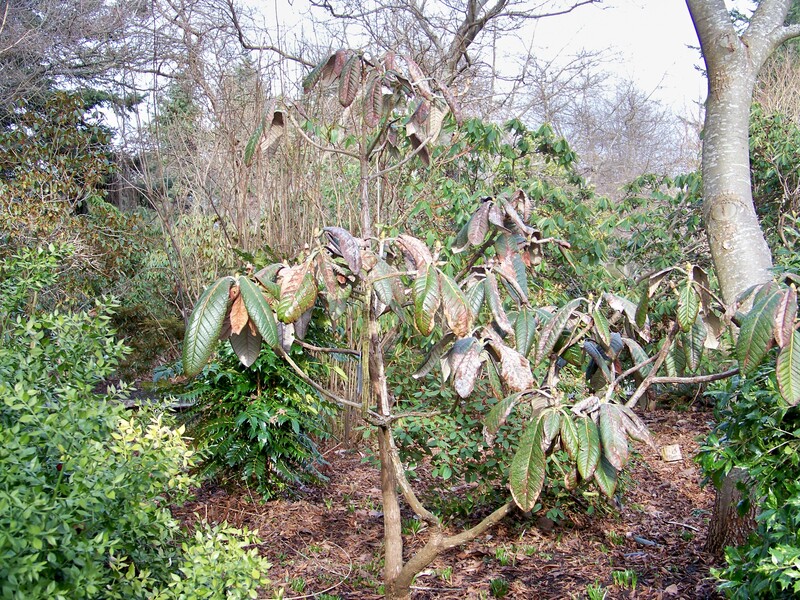 They like poor soil which is well-drained to produce less foliage. For the best flowering full sun is a must. they like a weak feeding of fertilizer or mulching in the spring as well as ample watering when they are in full growth mode. 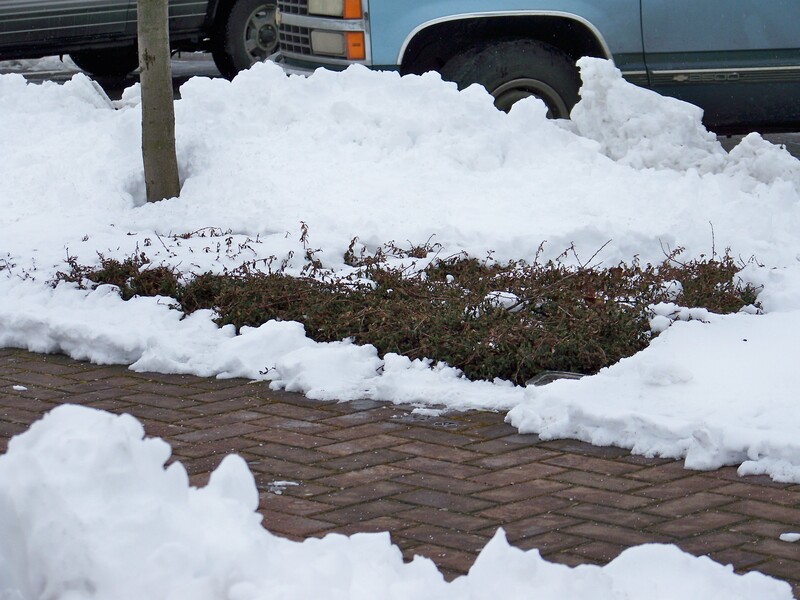 Remove spent flowers and water less later in the season. Their size ranges from .75 to 1.2m (28-48in) and spread is similar as they often are floppy if not staked up. 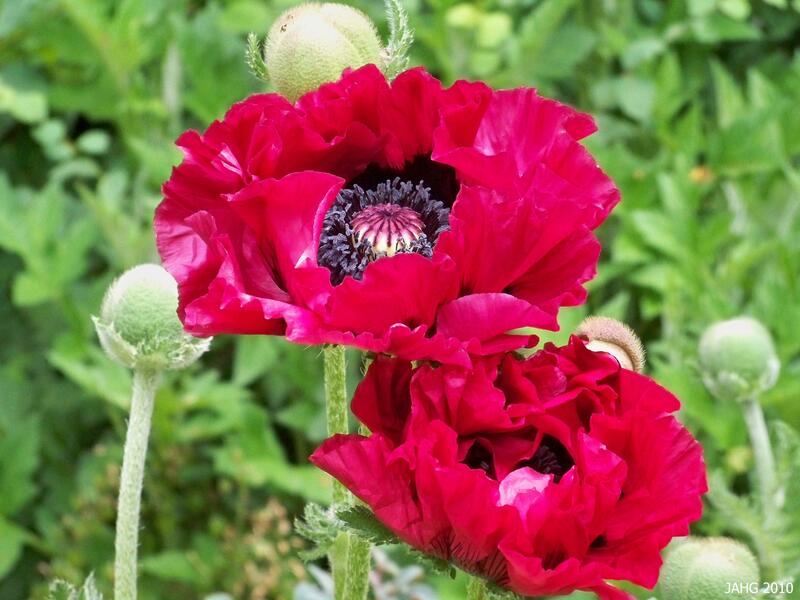 Papaver orientale 'Picotee' is one of the more interesting flower forms which is commonly seen. Many color forms are readily available at local nurseries or you can grow them yourself from seed, they are easy to germinate and will bloom in the following year from seed. There are several fine seed forms in reds, salmon, pink and white available. 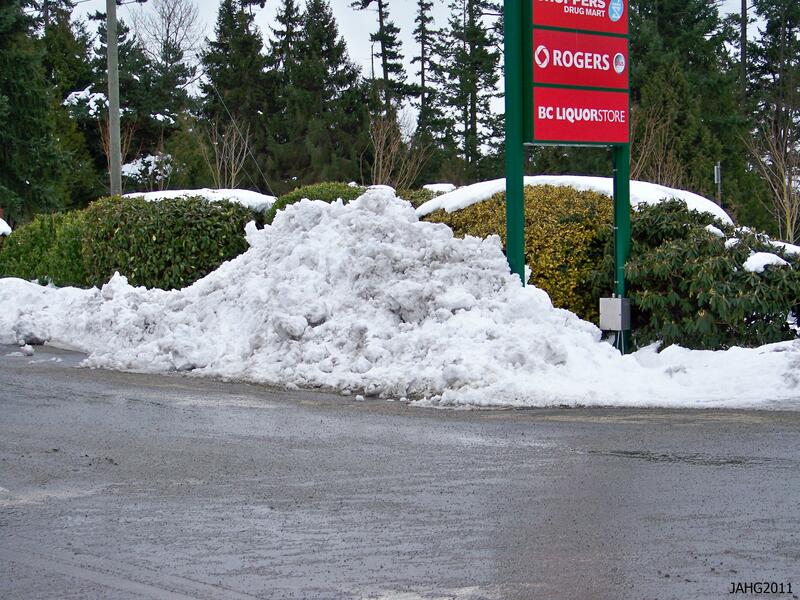 Division of clumps is only done in the fall as they do not like having their roots disturbed. Until we meet again here deep in the plants…. I have just moved this last week. I am having some issues with my internet and phone and will not be able to post any new plants until at least February 15th. Now you know whyIam calling this a DAZE!…because I am in a state of distress and disorganization. See you all soon with new plants and places!